The new Inland M30 Series is a collaboration between Inland Manufacturing and Sage International, Ltd. best known for their innovative EBR (Enhanced Battle Rifle) systems that are being used by military forces worldwide. Sage Enhanced Battle Rifle stock systems are precision machined from a solid billet of high strength aircraft grade aluminum and are finished with mil–spec hard anodizing. The EBR system increases accuracy and reliability, reduces perceived recoil, provides ambidextrous sling mounts and multiple Picatinny rails for mounting optics and accessories. In 1941, with the US being pulled into one of the greatest conflicts in world history, a division of General Motors was tasked to support the war effort. The result was firearm history with Inland Manufacturing becoming one of the largest gun manufacturers in the US, producing nearly 3 million firearms in less than 5 years. 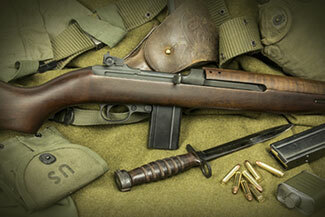 The most notable of Inland’s firearm production was the .30 Caliber M1 carbine and the folding stock variant, the M1A1 Paratrooper model. Dayton, Ohio was home for the original Inland company, and is now the home of the new Inland Manufacturing located just two miles from the original facility. Today’s Inland Manufacturing is now producing a new line of .30 caliber M1 carbines and 1911 style pistols.